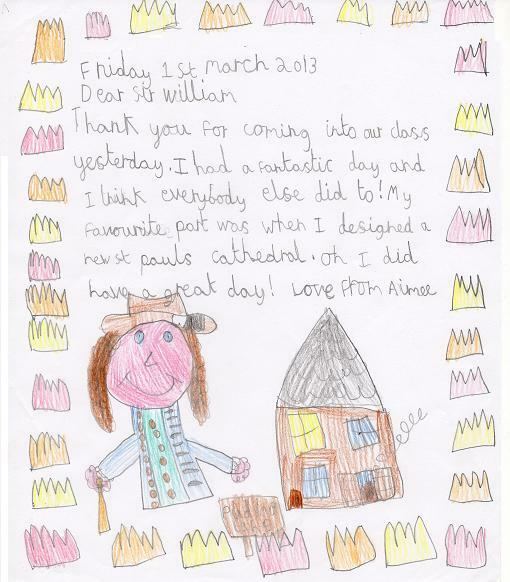 You can see from the artistic talent displayed above why Aimee was given the important job of designing a new St Paul’s cathedral. As Sir William would say, she has the ‘steady hand of a limnist’. 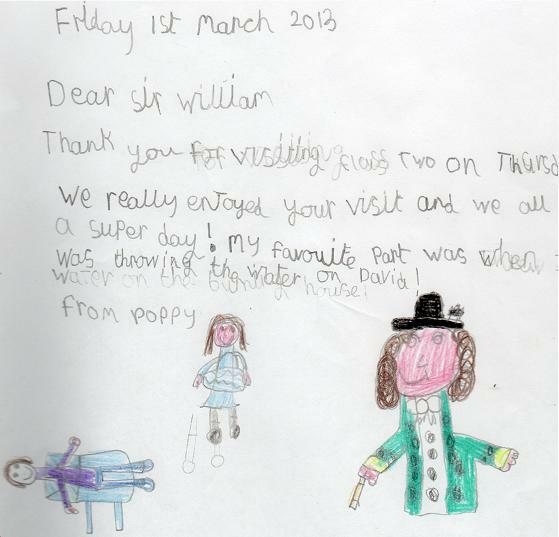 Poppy has drawn a very fine portrait of Sir William on her letter, with his green coat, periwig and lace-lined neck-cloth. At another school I visited very recently, the children were so involved in the story, and so keen to draw, that during their ‘indoors playtime’ (and we’ve had a few of those in Yorkshire lately) they also wanted to draw. 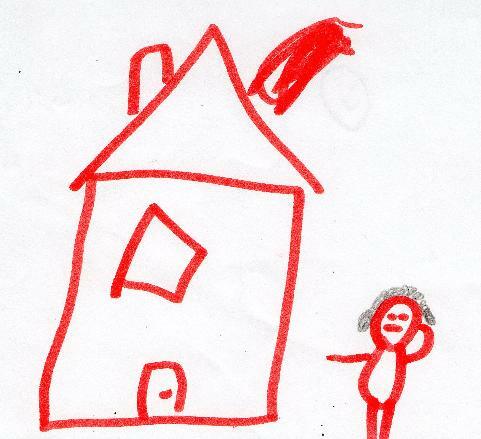 When Sir William returned from the teacher’s little coffee house he was handed several unprompted drawings and messages the children had fashioned up on their own initiative. 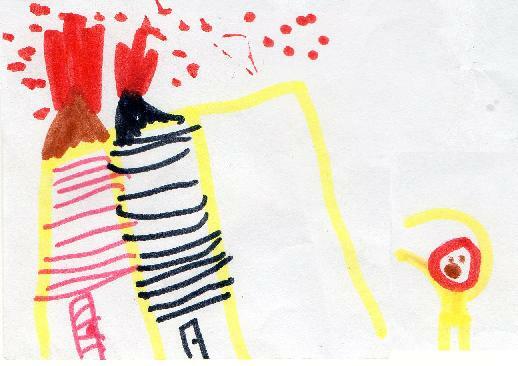 We had already learned about the sparks (shown very clearly in this drawing) carrying the fire across the city, but were only really at the start of the story when the child drew this. 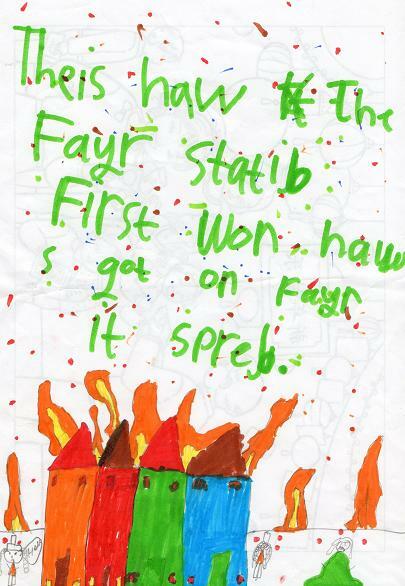 Whereas in the drawing below the fire has definitely spread to Thomas Farriner’s neighbour’s house. The gentleman shown here is so distraught his wig has fallen off, and if the redness of his face is anything to go by, the heat of the fire has certainly ‘cooked his noddle’! So, just a few of the letters and works of art Sir William has received. I hope you enjoyed them as much as me. 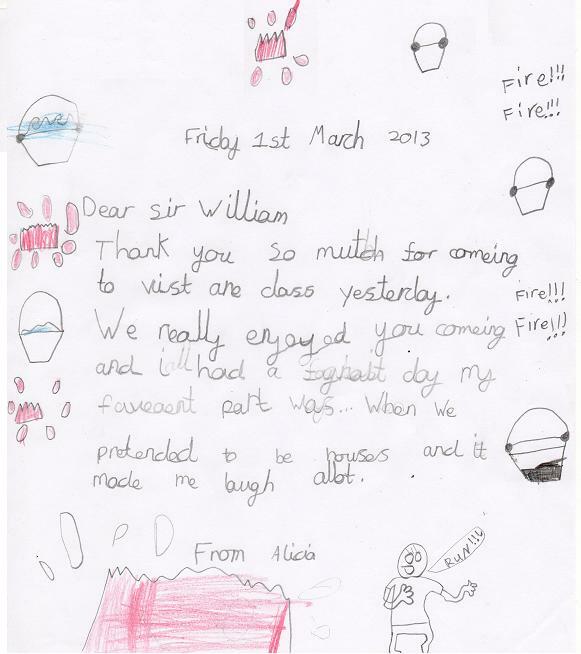 Click on the following link to find out more about Sir William Petty and the Great Fire of London. Next time, some portraits of Captain Eynos the Elizabethan Sea Rover, sketched by older children. Just want to say a big thank you for a brilliant day, yet again. A lot of the children said how much they enjoyed it and that it’s the best topic they had done this year. A number of them asked me if I’d had chance to see your horse, Nutmeg!